Some 3,500 species of mosquitoes inhabit the world, the females of which require blood to produce eggs. 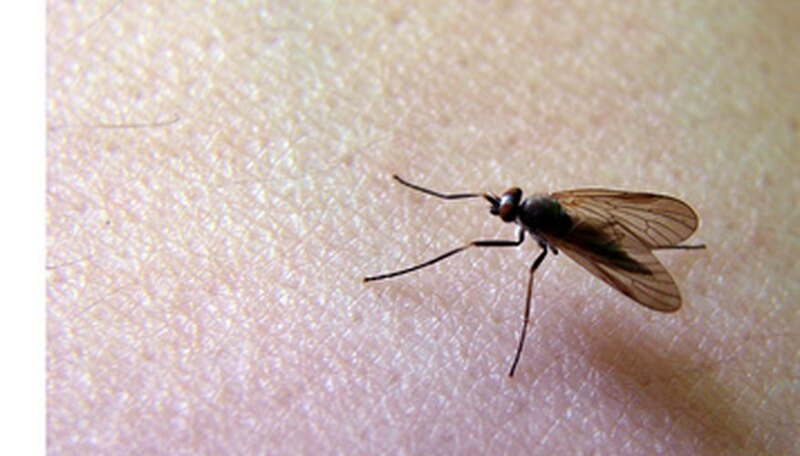 They are carriers of numerous diseases, including malaria and dengue fever. They thrive in standing water. Although there are ways of suppressing them in ponds, it is never easy to control them completely without resorting to toxic chemicals that foul the environment. To control mosquitoes, it is necessary to understand their basic habits. Mosquitoes almost never breed in moving water. Mosquito larvae are wormlike wigglers that live in shallow water; they like vegetation and floating objects to protect them from waves. Males feed on plant nectar; it is the females who feed on blood and cause the itching. There are many ways to prevent standing water from offering breeding grounds to mosquitoes; a pond is a special problem. Mosquitoes are easier to control on small ponds and those with a minimum of vegetation to protect the larvae. The generally accepted control methods are fish, bacteria, predatory insects, insecticides, oils and enzymes. These methods all kill mosquitoes when they are larvae or pupae. Goldfish and koi will eat mosquito larvae and pupae, although native fish are less vulnerable to herons and other birds. Some fish cannot tolerate cold water; others need a large pond. One of the best mosquito eaters is the 1-inch-long least killfish (Heterandria formosa); also good is the eastern mosquitofish (Gambusia holbrooki), the females of which grow to 1½ inches long. Nongame fish include the 3-inch-long eastern mudminnow (Umbra pygmaea), the 1-inch-long pygmy killfish (Leptolucania ommat), the 2½-inch long golden topminnow (Fundulus chrysotus) and the 3-inch-long guppy sailfin molly (Poecilia latipinna). Small, mosquito-eating sunfish include the 1½-inch-long banded pygmy sunfish (Elassoma zonatum) and the 3-inch-long bluespotted sunfish (Enneacanthus gloriosus). Sunfish that grow to 8 inches long are considered game fish in some states; these include the flier (Centrarchus marcopterus), the spotted sunfish (Lepomis punctatus), the bluegill (Lepomis macrochirus) and the redear sunfish (Lepomis microlophus). Some of these fish are sold at garden supply centers. Researchers at the University Florida recommend 20 to 50 mosquitofish in a 100-gallon pond. For larger ponds, stock one small sunfish for each 50 to 100 gallons of water. When mosquito larvae eat spores of Bti, Bacillus thuringiensis israelensis, a bacterium that occurs naturally in soils, it breaks down their guts, and they die in 2 to 12 hours. Bacillus sphaericus is another naturally occurring bacterium that is registered by the EPA for use against mosquitoes. It also disrupts the guts of mosquito larvae but does not harm mammals. These bacteria are commonly sold in garden supply centers in the form of cakes or sprays. The agency for Toxic Substances & Disease Registry of the Department of Health and Human Services lists a number of insecticides that are effective against mosquitoes. These include pesticides that have organophosphates as the active ingredient; synthetic versions of pyrethrin and methroprene are also acceptable. Pyrethrin is an insecticide extracted from pyrethrum, a variety of chrysanthemum; methroprene is an insect growth regulator that prevents adult mosquitoes from emerging from pupae. Petroleum-based oils sprayed thinly on top of the water suffocate mosquito larvae and pupae. Stephen Tvedten, who has written books on nontoxic ways of killing insects, says that enzyme cleaners can be used to kill mosquito larvae and pupae. Enzymes similar to those used by the human stomach to digest food are the bases of numerous commercial cleaners. Enzyme cleaners form a film on pond water that larvae and pupae can’t penetrate in order to get oxygen. Tvedten recommends 1 part enzyme cleaner concentrate to 50,000 parts water.